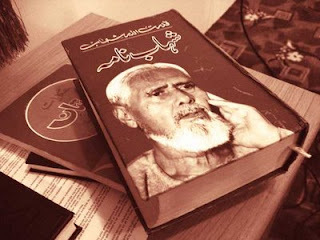 Shahab Nama is the autobiography of Qudrat Ullah Shahab. It was finished in 1986 just before his death. It was published the same year and soon he became a household name in Pakistan. Qudrat Ullah Shahab (or Qudratullah Shahab; 1917– July 24 1986) was an eminent Urdu writer and civil servant from Pakistan. Qudrat Ullah Shahab was a well known bureaucrat of Pakistan. He was from Jammu Kashmir and initially got into civil service by passing the Indian civil service exam some years prior to the independence of Pakistan. He served on several high offices including being Ambassador of Pakistan to Netherlands. He got well known to people after his book Shahab Nama got published, which portrays his life experiences. His early childhood was full of adventures, some of which are mentioned in his book Shahab Nama. The book has become a cult favourite in Pakistan. His personality reflected mysticism, something which he describes as a gift from an out-of-world personality which he named as ‘Ninety’ in his book SHAHAB NAMA, this mysticism belongs to Owaisiah chain of Sufism. Mumtaz Mufti and Ashfaq Ahmed, both well known writers of Pakistan, were close friends of Q.U.Shahab and were deeply inspired by him. Shahab Nama has sixty chapters and 893 pages (Sang-e-Meel Publications, Lahore, 2005). The first chapter entitled “Iqbal-e-Jurm” (confession) is about the author’s motivation for writing an autobiography. The next seven “Jammu main plague” (Plague in Jammu), “Nanda Bus Service”, “Chamkor Sahib”, “Raj keroo ga khalisa baqi rahey na ko” (No one else but the Khalsa shall reign), “Maharaja Hari Singh kay sath chahay” (Tea with Maharaja Hari Singh), “Chandravati”, and “ICS main dakhla” (Entry to ICS)chronicle his early life up to entry into Indian Civil Service. Chapter nine to fifteen describe author’s experiences during his initial postings to different parts of India and creation of Pakistan in 1947. Four chapters are devoted to Mr. Shahab’s writings and critics’ comments on them. (Chapter 16 to 19). Chapter 20 is on the new state of Kashmir (“Azad Kashmir”) and 21 on assassination of the first Prime Minister of Pakistan, Liaquat Ali Khan (“Sila-e-Shaheed”). Chapter 22 to 34 are devoted to author’s experiences as Deputy Commissioner of Jhang District in Punjab. After a year in Jhang, Mr. Shahab left for the Netherlands on a scholarship to attend a six-month course at the Institute of Social Studies in The Hague. Two chapters, 35 and 36 are on his impressions of the Netherlands and his decision to proceed to Hajj. Chapter 37 and 38 are a pilgrim’s tale. “Jhoot, fraud aur hirs ki daldal” (The quagmire of lies, fraud and greed), chapter 39, details author’s time at the Ministry of Industries as Director. For the next 200 pages, chapter 40 to 50, Mr. Shahab delves into politics of his time as observed by him as the Principal Secretary to Governor General Malik Ghulam Muhammad, President Iskander Mirza and General Ayub Khan. The last ten chapters of Shahab Nama deal with a variety of topics such as death of his mother (“Maa ji ki wafaat”), life of an Ambassador (“Rozgar-e-safeer”), the future of Pakistan (“Pakistan ka mustaqbil)” and so on. There is a chapter titled “Iffat” dedicated to his late wife. The last chapter is about his mystical experiences.